Dear Friends, It has been an incredible year of growth and I can hardly believe 2018 drawing to a close. My online presence has grown since I began teaching across the globe, and I have met the most wonderful people along the way. Below are the last of my 2018 courses. 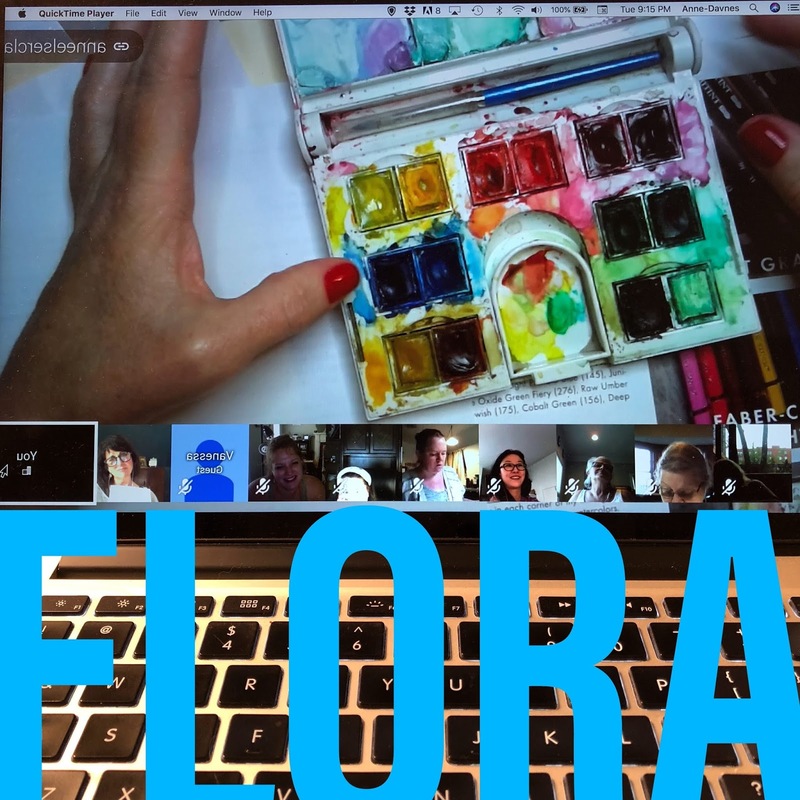 New here is FLORA II, an extension of FLORA. She'll return next year with bells on, along with all of my other classes, including new ones I have yet to talk about. If you're hesitant to take an online class, I encourage you to do so. I have found it as enriching and engaging as meeting in person. For personal feedback, you can email me your work, and I will respond with comments. We all grow closer together with each class, and our conversations are so much fun, and healing, too. 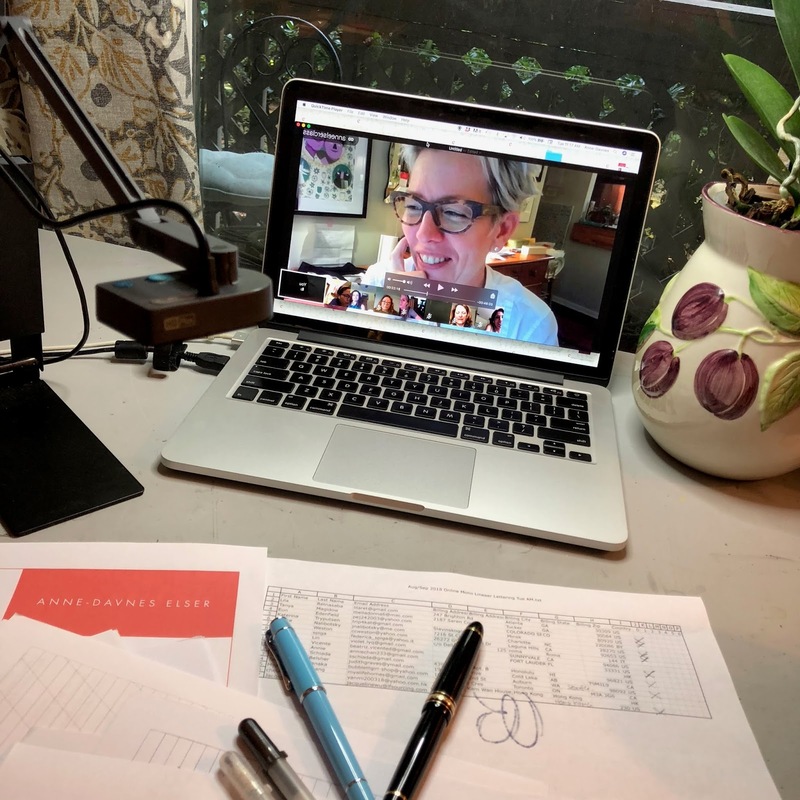 We use Google Hangout to gather, and what you see on your screen is as crisp as what you see on a projected image were you looking at a wall in a room with other students. I also make a recording of every live class, which means that you can download or stream that recording for as long as you like, replaying it when it's convenient for YOU. Above is a snapshot of what your screen will look like during class. Everyone has a box, and you can make each one larger by clicking on it, including mine. We open and close each class with a group discussion, then move right into warmups and guided tutorials that move at an easy pace, step by step. Class Schedule: We will meet Tuesday mornings from 10am-12:30pm EDT for the first three weeks, then 10am-12:30pm EST for the remaining 4. Our first meeting is a brief intro and dry-run test call on Tuesday Oct 16th from 10-11AM EDT. Course instruction officially begins the following Tuesday, Oct 23rd from 10-12:30AM EDT. This course is presented to you at the request of my first batch of online FLORA students who did NOT want our 6 weeks to end. Truthfully, I didn't either! We'll be using the same handouts you've already recieved, but will be building upon that process to produce new foliage leaning into the FALL and WINTER holiday seasons. Think holly, apples, garlands, ribbons, evergreens, and all things pumpkin spice! This is a LIVE class, which is recorded for your enjoyment and review, then uploaded to a class folder on my Dropbox site each of our 7 weeks of class time together. If you ever have to miss a class, you can always check back later to watch what you missed abd practice at your own pace. I really enjoy the live format, and meeting so many people all over the world each week in my home. Live classes allow the student to interact with me and each other for specific feedback. When registration closes, I will email a permanent weblink to you. This will be our virtual classroom for every time we meet. When the link and intro email is sent to you, click the link, which will open a web page in your web browser. And that's it! Google may ask you to download their software and if they do, just follow their prompts. Please read technical notes way down at the bottom for details about participating in an online class via Google Hangout. • Link to our online classroom folder where you can find uploads each week and a PDF link to exemplar packet t download and print out for our first class. After each live class, I’ll upload either a full-length recording of my demonstrations during the class OR a 20-minute review of the pages we worked on (and snapshots of those pages) for you to later download at your conveneince. This makes it easier for students to keep up with the class if you cannot participate live. Every single class is live so that we can all interact with each other. I record EVERY class and upload this file immediately after class ends. You may stream the recording and you may also download and keep it. I record my classes so that students can still participate if they can't attend because of illness, time zone differences, or other issues. If in the event a recording malfunction occurs, I upload a brief review of the class, using the notes and pages I already created. I also upload images of my pages for you to view and keep for your personal use. If you can't be there. How soon after a class ends, will I be able to view it online? It generally takes 12-24 hours for a class recording to fully upload. 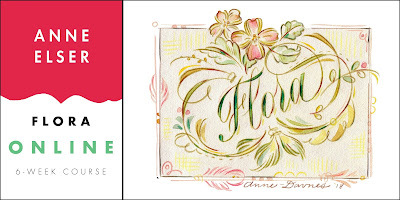 This class or workshop is suitable for calligraphers, tweens, and all adults. Class Schedule: We will meet Tuesday evenings from 6PM-8:30PM EDT for EDT for the first three weeks, then 6PM-8:30PM EST for the remaining 4. Our first meeting is a brief intro and dry-run test call on Tue Oct 16th from 6-7pm EDT. Course instruction officially begins the following Tuesday, Oct 23rd and goes from 6pm-8:30pm EDT. 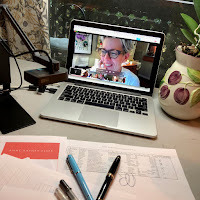 This is a LIVE class, which is recorded for your enjoyment and review, then uploaded to a class folder on my Dropbox site each of our 6 weeks of class time together. If you ever have to miss a class, you can always check back later to watch what you missed abd practice at your own pace. I really enjoy the live format, and meeting so many people all over the world each week in my home. Live classes allow the student to interact with me and each other for specific feedback. • PDF link to exemplar packet. The speed of digital communication today has gifted us with more time to pursue things we love. But somewhere along the way, we’ve forgotten how good it feels to use a writing instrument to record our thoughts for ourselves and to those we love. Writing, and the time it takes to produce letterforms, is good for the body, mind, and spirit. It is also a gift to the recipient, who holds your elevated thoughts in their hands, literally, and with far more consideration and pause than through a text or email. The child of Spencerian calligraphy, Cursive Handwriting is not forgotten, because we have made a table for you to come join us in one fun and joyous day of lettering. Students will learn (or re-learn!) capitals and lower case letterforms, through formal exercises in structure, rhythm and flow - all standards similar to those taught not that long ago. Time is spent on spacing and lower case characters. Later we’ll dance with capitals and dive right into an envelope addressing/letter writing project. 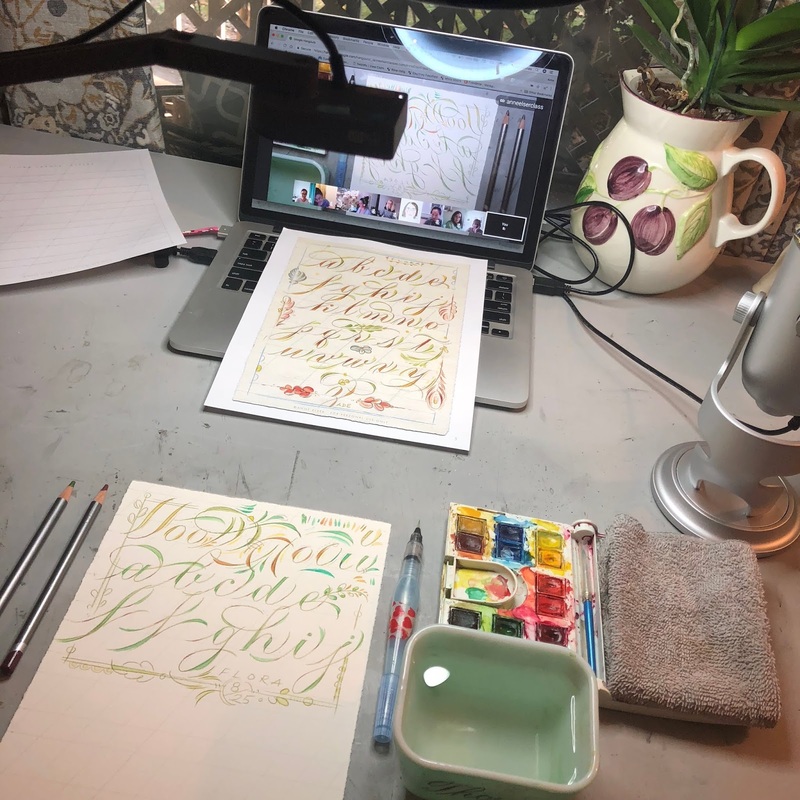 The second half of this class or workshop is spent on the construction of open-shaded letterforms based on principles of script writing done with pointed pen. Using a mono linear tool to describe the contour of a shaded stroke offers insight into its construction with its native tools, the broad-edge, pointed pen, or paint brush. Drawing these letter forms is not only useful in sketching out and planning of larger projects to be later filled in with ink, I believe they are also valid and beautiful class of letter forms in and of themselves. Because these letter forms are drawn with tools more commonly used today, they are the style I use more frequently in my every day writing, and therefore, have become more useful and precious to me than anything created with a dip pen. I am constantly writing letters and notes, whether on a chalkboard for my students, wedding signage for clients, fabric labels, canvas bags, handkerchiefs, monograms, journal pages, letters to friends, and much more. Rendering a shade with a contour line offers the artist another opportunity to love the letter and learn more about the letter, and deepen your understanding of its relationship with other forms and unique features. Expression of the universal line of beauty need not be restricted to our ability to carry a pointed pen and ink well around with us every day. We can, with any mono linear tool and at any moment, study and celebrate our love of these forms with a crayon on the back of a paper menu, a pencil at the top of a grocery list, a marker labeling a box of preserved memories or a bag of home-made treats for a friend, the inside label of our child’s school uniform, every page in our journal entries, letters to friends, notes to beloved partners, and even our fingers in the sand. or ALL if you’re wanting to try a variety. • Strathmore Calligraphy Writing Paper Pad 8.5 x 11. • Classic Crest Antique Gray 24 lb. Smooth Writing Paper. This comes in a ream of 500 8.5 x 11 sheets and works very well with fountain pen ink. Buy at www.neenahpaper.com. • Southworth Resumé paper by Neenah. Office Supply stores sell this as well as amazon.com. Comes in white or ivory and has two weights: 24lb and 32 lb. I’ve used both for folding letters/envelopes. Fidelity Onion Skin Paper. I LOVE, LOVE, LOVE this stuff. Purchase at ThePaperMillStore.com. Item # ONSKN-N. It’s very thin and a delight to write on with a fountain pen and is VERY transparent. I use this for writing letters and for practice during class. • A variety of ultra fine, fine, and medium point pens (for wide markers make sure to get bullet point and not chisel). These need to be your favorites. Listed below are pens I’ve loved and used in the past. • Sakura Gel Pens. My faves are the Black Glaze and white (the white looks pretty boss on black paper). She currently teaches private lessons in person and on-line from her home studio in Decatur, classes and workshops year round at Binder Art Supply in Buckhead and at their Ponce City Market location, occasional workshops at The Spruill Center for the Arts, and classes and workshops at Aikido Decatur. She also travels in the states and abroad conducting workshops. Class Schedule: We will meet Wednesday evenings from 6-8:30pm EDT for the first 2 classes, and then 6-8:30PM EST for the remaining 4. Our first meeting is a brief intro and dry-run test call on Wednesday Oct 17th from 6-7PM EDT. Course instruction officially begins the following Wednesday, Oct 24th from 6-8:30PM EDT. After each live class, I’ll upload either a full-length recording of my demonstrations during the class OR a 20-minute review of the pages we worked on (and snapshots of those pages) for you to later download at your convenience. This makes it easier for students to keep up with the class if you cannot participate live. 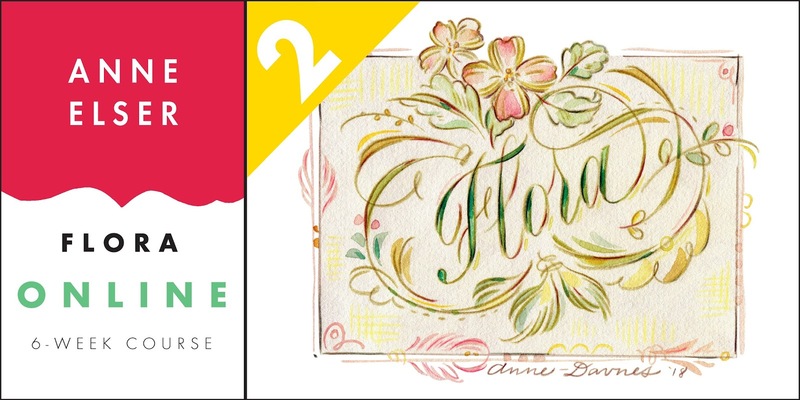 The definition of flourish is to flower. We all flower in our language, thoughts, hopes and dreams, body movements, voices, and in our relationships with each other and the beautiful big world we share. But most importantly, we flourish all by ourselves - our bodies do this automatically - we were built this way. Look at the branching of blood vessels in our bodies, how our fingers splay open or fan out like flowers, the growth pattern of the hair on our heads, all the many muscles in our face that produce a genuine smile. That’s flourishing. You have permission to flourish. And THAT is the largest obstacle we all face. Everyone can flourish, but it is a daunting task for so many of us to draw one on paper. 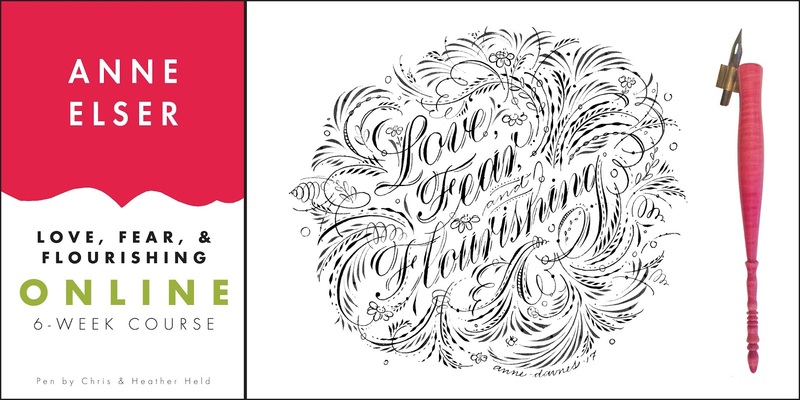 This workshop is designed to create a sense of ease with the idea of flourishing. We will identify points of fear and anxiety in our approach to flourishing, that wobble our lines and tense up our bodies, and we will heal ourselves from these negative work habits that make any exploration, especially this one, an unpleasant task. We’ll train the eye and awakening the body (fingers, wrists, elbows, shoulders and breath) to align with each other. We’ll begin with identifying the unique capabilities of our joints and how they best function in relation to the kinds of strokes we are drawing, from the wrist, elbow, shoulder, and fingers. We will begin to train our bodies to capably reproduce the elements of flourishes that make them work and that our eyes have learned to identify: Ovals, Perpendicular Intersections, Intersecting Ovals, Parallel Strokes, Shade and Hairline Relationships, Accents, Textures, and MORE. We'll fall in love with the oval, so that are lines are never lost, always at home, and always pointing back towards home, at every angle and size imaginable. You cannot flourish without making ovals. And you won't want to make one, if it doesn't FEEL GOOD to make one. We'll make it feel good AND we'll train your eyes to identify opportunities for oval placement. Working in pencil, straight/oblique pointed pens, and everyday pens (everything from felt tip, roller ball, gel pens, fountain pens, etc.) we’ll memorize standard flourishing movements and exercises that have been around a long time, and how to adjust and vary their proportions to suit our needs. We’ll learn how to exaggerate ascenders and descenders, the crossing of t’s, and the endings of words. We’ll learn to curl these strokes around the graceful curve of an oval, so that our pens are never lost, our strokes finding their way back home, even through the most subtle of suggestions. We’ll make flourishes that stand alone, work with each other, and that accent a word. And best of all, we’ll do this together. We'll undo and heal all the negative thoughts you have in your head about your capacity to flourish. This course is a giant oval-shaped hug for your hands, your body, your thoughts, and of course - your work. Purchase a pair of earbuds or headphones to wear during class. Binders Art Supply (bindersart.com) is the best local Atlanta spot to purchase supplies for this class and they will give you a student discount! Anything that you can’t find there, can be purchased at John Neal Books (johnnealbooks.com) or Paper and Ink Arts (paperinkarts.com). Transparent Marker Paper: Suggested brands below, but use whichever brands you’re comfortable with. Colored Paper: Any smooth paper that works well with Dr. Martin’s Bleedproof white. Suggested brands below. • Colored or Ivory Cover Paper: Any ink-friendly paper that won’t bleed with the ink you are using. Cut to around 5 x 7. • Arches Hot Press Watercolor paper. Paper for Folding Envelopes: Ink-friendly high-quality paper. Any of these below will do. • Southworth Résumé Paper in White or Ivory (24 or 32 lb.). Neenah Paper sells this 100% cotton sheet in boxes of 100 at any office supply store or on amazon.com. Dark Ink: Any dark ink that shows up on white practice paper. • Sumi, Higgens Eternal, Mcaffrey’s, Walnut, etc. • Colored inks of your choosing that won’t bleed. (My favorites are gouache/water/gum arabic mixtures). • Metallic Pan (cake) inks: Finetec metallics and other brands. • Pointed pen nib for lettering and flourishing and a pen holder. I prefer using an oblique pen holder, but you’re more than welcome to use a straight holder if you prefer. • Feel free to bring in embellishments like stickers and stamps! 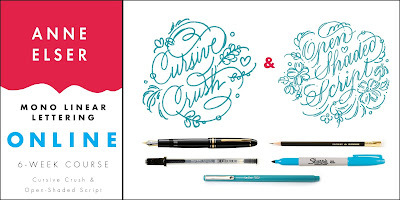 • Any glitter pen or glue you’d like to use accent your lettering. I Love a Clear Star Gelly Roll pen by Sakura. • Glitter Glue, gems, etc., for accents. Class Schedule: We will meet Saturday mornings from 10am-12:30pm EDT for the first 3 weeks, and then 10am-12:30pm EST for the remaining 3 weeks. Our first meeting is a brief intro and dry-run test call on Saturday Oct 20th from 10-11AM EDT. Course instruction officially begins the following Saturday, Oct 27th from 10AM-12:30PM EDT.